SPAM Zapper - SPAM Stops here - SPAM Filtering Solutions. SPAM Zapper - Gain Control of your Email again. Welcome to the Home of the SPAM Zapper. Stop Spam, Improve Productivity, and reduce Network Attacks. Today's Internet is a haven for hackers and spammers. More Spam, more Viruses, and now even the Zero Day Exploit. Firewalls cannot stop the attacks, and Virus scanning does nothing to filter spam or reduce network traffic. Thousands of dollars are lost in productivity, and outages. But there is something that you can do to change all of that! SpamZapper is not just another Spam filter, because a filter always has Spam in the pipeline. 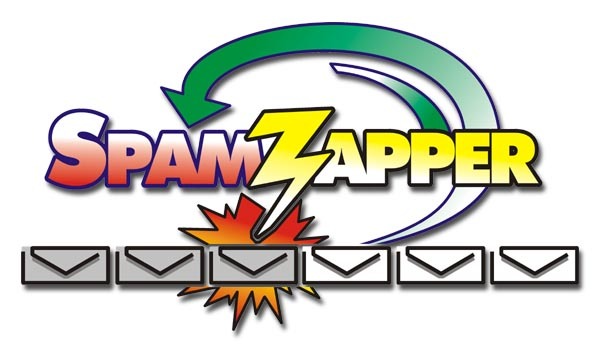 SpamZapper is a Spam eliminator, now you can use email to communicate again! SpamZapper is a Multi-Layered defense for Email Security. We guarantee that we will eliminate your Spam, Viruses, Spyware, Trojans, and other malware from your Internet Email AND deliver your wanted Email. Our customers tell us that we have the Best Tools available anywhere. "When we signed up, the SPAM and Viruses just stopped!" That's a comment from a recently satisfied customer. Imagine putting your Email address on the Internet again (yes, we are serious), and being able to use it for communicating again. In light of recent Activities on the Internet, we invite you to review our Internet Security 101. It may be time that we all review our security, privacy and how we protect ourselves, especially on the Internet. Sign up to day and get your first two weeks of service FREE. - You must Call us at 412-515-3010 to take advantage of this offer. If you decide to disconnect before the two weeks are up, then you pay nothing. We provide the Maintenance, we provide the updates, and best of all, you earn a Return on your Investment (ROI) in the first 30 minutes. That's it! It cannot be easier to read clean email again. And for those of you interested in implementing different controls, we have the ability to provide filtering for the Domain, the user, and everything in between. This is our best offer ever. If you do not see a difference in your email in two weeks (we think that you will see it within 72 hours), then you owe nothing. 'Gain Control of your E-Mail again.' - We can show you how! If you would like to join our Information List, Please sign-up Using our on-line Mailing List.